World Health Organisation, WHO, has called for prioritisation of actions to prevent people becoming overweight and obese, beginning before birth and in early childhood, following predictions that over 18.2 million Africans, including an estimated 4.8 million Nigerians, may become diabetic by 2030. On the occasion of World Diabetes Day 2016, November 14, the WHO issues a call for action on diabetes, drawing attention to the need to step up prevention and treatment of the disease. Over 7 million persons that are diabetic in Africa, atleast 1.7 million are Nigerians, but as a result of adoption of Westernised dietary habits, physical inactivity leading to overweight and obesity, the burden of the disease that has silently been on the increase over the years is expected to explode over the next decade. 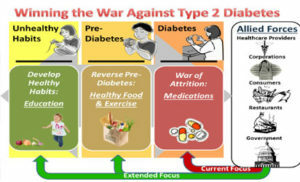 According to WHO Global report on diabetes that underscores the enormous scale of the diabetes problem, and the potential to reverse current trends, notes that the creation of a combination of fiscal policies, legislation, changes to the environment and raising awareness of health risks works best for promoting healthier diets and physical activity at the necessary scale. Latest WHO data says, 422 million adults have diabetes while 1.5 million deaths are directly attributed to diabetes each year. The WHO fact sheet on diabetes shows that 1 in 3 adults aged over 18 years is overweight and 1 in 10 is obese. The first WHO Global reports that the number of adults living with diabetes has almost quadrupled since 1980. the dramatic rise in type 2 diabetes and factors driving it include overweight and obesity. Africans have been warned to be mindful of adopting western lifestyle which has been blamed for rising cases of diabetes not only among top executives but also school children. The growing problem of diabetes has relatively been attributed to overweight and obesity, due to reduction in physical activity and adoption of unhealthy diets which are high in calories from fats and sugars, high in salt, and low in vegetables and fruits. The WHO notes that most people with diabetes in Nigeria and Africa are unaware of their condition and therefore do not seek treatment and care. Yet, untreated, uncontrolled or poorly managed diabetes leads to serious complications such as heart attacks, kidney failure, stroke, lower limb amputations, visual impairment and blindness. Prevention of diabetes or delay in the onset of diabetes and the development and progression of its complications can be achieved through healthy diets, regular physical activity, maintaining a normal body weight, avoiding tobacco use and monitoring blood-sugar levels. Warning signs from WHO include frequent urination, recurrent thirst, intense hunger, weight gain or unusual weight loss (for people with type 1 diabetes), increased fatigue, irritability, blurry vision, delay healing of cuts and bruises, sexual dysfunction etc. The WHO Director-General, Dr Margaret Chan said: “Diabetes and its complications impact harshly on the finances of individuals, their families and the economies of nations. People with diabetes who depend on life-saving insulin pay the ultimate price when access is lacking. “As part of the 2030 Agenda for Sustainable Development, Member States have set an ambitious target to reduce premature mortality from NCDs – including diabetes – by one third; achieve universal health coverage; and provide access to affordable essential medicines – all by 2030. We have an enormous task at hand,” she noted. The new report calls upon governments to ensure that people are able to make healthy choices and that health systems are able to diagnose, treat and care for people with diabetes. It encourages healthy eating, physical activity and avoidance of excessive weight gain.